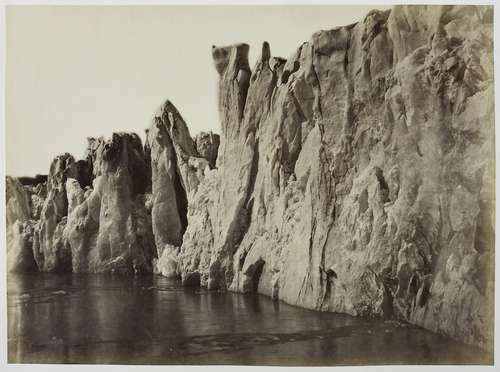 "Front view of the Glacier near to the rocks over which it is moving. From the water's line to the top is from 275 to 300 feet high, and the current flows directly from the front of the Glacier, at the rate of about three miles the hour, through the arches and holes in the Glacier. The arches or caverns seen in icebergs are mostly formed previous the berg being broken off from the glacier."